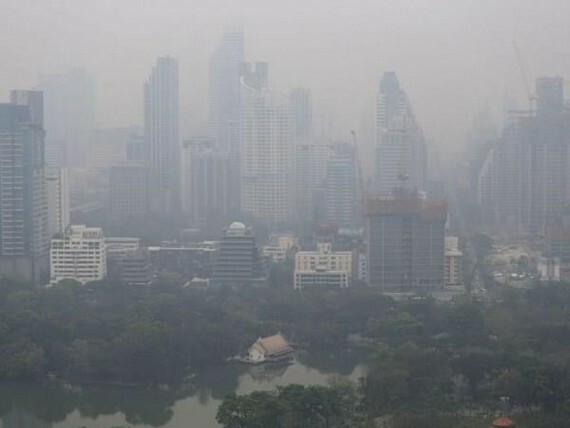 Many provinces in northern Thailand on March 31 reported disastrous levels of smog, which pose a threat to public health. The March 31 Air Quality Index showed that poor air quality in several localities of Chiang Mai, Mae Hong Son, Lamphun, Lampang, Phayao and Chiang Rai provinces were in red zone as PM2.5 - particulate matter fine enough to enter a person's bloodstream through the lungs – surpassed the acceptable level of 50 micrograms per cubic metre (µg/m³). The worst air quality was in Mae Sai district of Chiang Rai, where the index was at 467, far beyond the unhealthy threshold of 200. Local authorities have conducted measures to reduce air pollution. The Disaster Prevention and Mitigation Department deployed trucks to spray water in hopes of reducing the heavy smog. People in the hardest-hit locations were advised to wear masks. Mae Fah Luang University in Chiang Rai decided to cancel all classes on April 1-2. Prime Minister Prayut Chan-o-cha is expected to chair a meeting in Chiang Mai on April 2 to discuss solutions to the problem, which is said to continue developing complicatedly in the coming days.